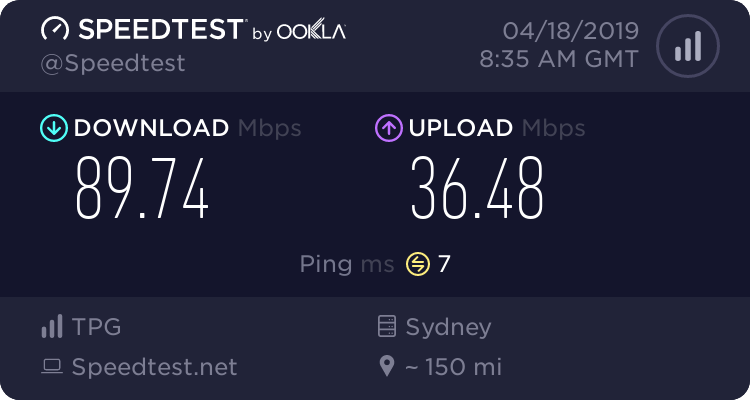 NBN so far, whats your experience? Re: NBN so far, whats your experience? Getting a new copper service from NBN is $300. There are no cheaper options like Telstra had. As for the reasoning around FTTP and the cost or benefit of over 100Mb services, it’s simple. Everyone on a fibre service can get 100/40 now and faster speeds if required. However, for those on FTTN not everyone can even get 25/5 so forget 100/40 or anything faster. Also active equipment vs passive equipment, guess which one will fail more? If you are so far away from the node that you are limited to 25mbs, then you're probably up for a substantial bill to upgrade to full FTTP. I pay for 50/20. I get approx 32/11. Sorry, Sarge, maybe it is already on record somewhere. How are you connected to the NBN ? FTTP ? FTTN ? - if so how far away is your node ? Are you Urban, Suburban, rural or Townie ? Not sure where the closest node is but can't be too close with those numbers. My old house which was about 100m from the node saw a sync speed of about 44mbps. I have to say I've not noticed any difference between my old adsl2 (15 Mbps) and my new broadband (45 Mbps), both tested at speedtest.net. I did get some netflix problems when my speed dropped to 4 Mbps due to a line fault. My only complaint is 'weak' wifi on the new gateway the ISP supplied me with, silly me thought being new it must be better than the old one. So the NBN has given me no noticeable speed increase but taken away some wifi, I was better off with adsl2 and a modem that had better wifi. I stuck with my old ISP Modem .... as it only used 2.4Ghz WIFI .... I have a 3-level split home ... and the modem is downstairs at one end of the house. I reckon I'd have issues if i went with the new modem with 5Ghz ... as coverage is less ... but bandwidth is higher. It works for me at the moment .... so no complaints. I was explaining the benefits of fibre and dispelling some common myths. Personally I’m on FTTN and am close enough to get 100/40 and have a maximum of 117 residences that can connect. Throw in a lot of elderly and local node congestion isn’t an issue for me. I Hate being bound by an ISP's router. I use a wifi router connected as a switch (No DHCP server). I want to be able to VPN to my home from a remote location, and VPN to a remote location from my home router. I want content filtering on my router based on periodically downloaded rules. I do not want an archaic and/or consumer piece of HW between me and the world. Draytek support said that they could help out by replacing the ISP (Optus) supplied router, and putting it in a DMZ to keep the phone going ... this is my plan ... however I have some 'flux' in my work life that may delay this. I switched off the 5 Ghz wifi already because non of my devices have it. Now I'm looking at wifi extenders but to be honest I think there's something else going on like a dodgy netcomm wifi router. I use a Fritz!Box for my modem. Wouldn't use anything else now. Do not use a Wifi Extender ! Check your area using an app like "Wifi Analyzer" in Android Store by Kevin Yuan - might see that your neighbour is blasting you with a strong signal. I've got my letter advising NBN will be ready mid June. I'm currently paying $59.99/mth for unlimited ADSL2+ and getting north of 10mbps+ consistently. Router currently showing 14.5mbps. The lowest they are offering is NBN12 unlimited for the same price but have NBN50 which is an extra $10/mth. I live close to both a node and the exchange so I hope I would get a decent speed on NBN50. Problem is you don't really know until you get it. Wirless here for about 18months. It works, a bit slow, however does not work in rain, slightly heavier rain stops it completely. Good thing is we're in drought at present. I have been on FTTP with TPG 100/40 for nearly 3 years now. I changed the generic router they send out to a TP-LINK Archer C9 which made a huge difference. 2011 Fg GS Ute 5.0 Manual. 2015 SRT Jeep 6.4 Hemi.